Safari Heat slot machine from Playtech takes us off to the wild savannah of Africa where we find many of the worlds biggest mammals on the games 5 reels. The mobile slot and its imagery capture the mood of the game nicely and there is a huge max jackpot of 10,000x. There is also a tasty bonus feature with 15 free spins and a 3x multiplier on offer. All of the details can be found in the Safari Heat slot review below. For those of us who have neither the time nor bankroll to take a trip to the wilds of Africa, a savannah-inspired slot can be the next best thing – or at least, that’s the rationale behind Playtech’s Safari Heat slot. 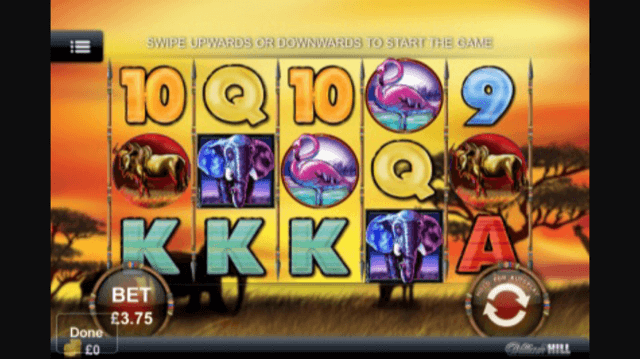 Featuring five reels and 15 adjustable paylines, the Safari Heat slot machine includes all of the animal symbols that have now become synonymous with slots of this nature, with elephants, rhinos, zebra, bison and flamingos all featuring as higher-value icons. A majestic lion also appears as a substitute wild that not only doubles the value of any paylines it features in, but also awards the jackpot of 10,000x your line bet. Playable from anywhere between £0.01 and £750 per spin on desktop, mobile and tablet devices, Safari Heat is a game that caters for players of all walks and bankroll levels. Though relatively low-variance, the slot does also include a gamble game to spice things up if you’re not afraid of a little risk. Indeed, after any single spin in the base game or at the end of the bonus feature – which we’ll get to in a second – players can elect to chance their arm at a simple red or black picking game. As you’d expect, any correct guesses here double your current win up to a maximum of £1,000, while an incorrect pick results in you forfeiting the lot – so think carefully about the money before playing on. If all that high-risk decision-making is a little too rich for your blood, don’t despair – Safari Heat also features a free spins bonus round that can be activated by landing three or more Moab trees anywhere on the reels. Not only will this reward them with 15 free spins, but the value of any wins collected during the feature will be trebled and further games are also awarded for any subsequent re-triggers. Putting The ‘Plain’ In Plains? While the Safari Heat slot is a decent enough game in its own right, it’s a fairly run of the mill game that doesn’t really boast enough in the way of original features to make it stand out from other Playtech slots. Like the Safari Heat slot review? Check out these as well…..